Combining its commitment to continuing education with an emerging product, H.J. 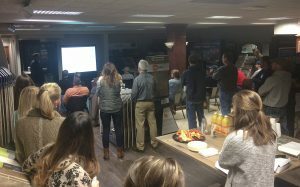 Martin and Son on Jan. 12, 2017, collaborated with Crossville and the Brown County Home Builders Association for a course on the tile manufacturer’s Laminam product. 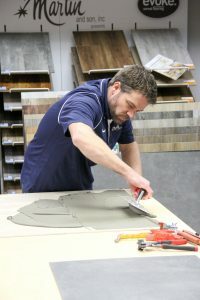 Attended by roughly two dozen area professionals of the building industry, the 90-minute session focused on both product characteristics and installation techniques. Eric Owen, north central (U.S.) & Canada regional manager for Crossville, shared a brief history of tile products, starting with basic 2×2-inch tiles in the 1980s. As the consumer market asked for “less grout,” according to Owen, tile sizes initially grew to 8×8-inches and 12×12-inches. Today, common tile sizes are 12×24-inches and 18×36-inches. Two new technologies – Laminam and Continua – are integral to modern tile manufacturing. 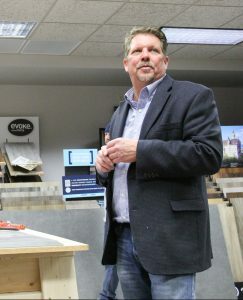 “We need technology to do what we do today in terms of tile size,” says Owen. With Laminam the tile is pressed between two steel plates, while two steel rollers are utilized with Continua, allowing for production of tile sizes of two big countertops. Laminam by Crossville’s innovative tile panels are some of the largest in the porcelain industry at 9×3 feet. The material is also quite thin, and is produced at 9/64th of an inch. The tile is so long, two or more people are required to handle the installation process. 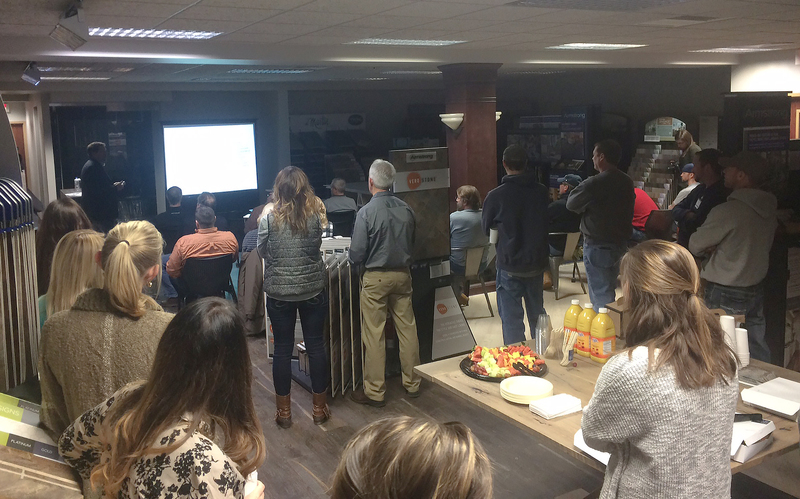 Owen shared with the group many of the applications of Crossville’s Laminam products: remodels, where new tile is going over existing tile; shower enclosures; elevator walls; countertops with a single porcelain panel, such as at reception stations; and exterior cladding, such as on the outside of a building. Advantages of Laminam product use include a dustless installation and, in the case of Crossville, the availability of more than 108 product colors. 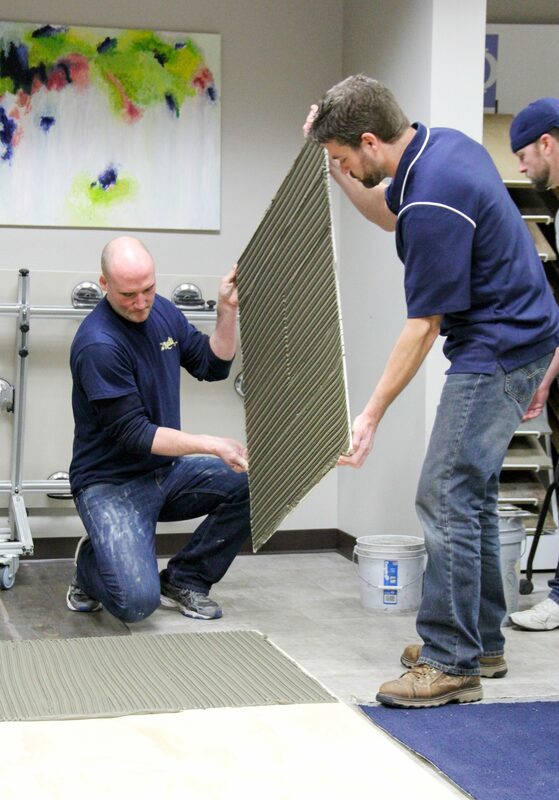 Owen told those on hand that long-term cost savings also are typically realized because of the product’s durability, with a reasonable price point of $7-20 per square foot. Continua often is utilized when tile is going in over granite or marble, for lobby walls, for steam-room ceilings and on large-scale staircases. The learning session closed with an in-person demonstration of installation techniques and tips, using installers from H.J. Martin and Son. Details such as grouts and edge treatments were part of the dialogue. H.J. Martin and Son offers a wide variety of tile and stone products from its Northeast Wisconsin locations in Green Bay and Neenah. Much more can be learned on the company’s website. Based in Crossville, Tenn., Crossville is a leading manufacturer of tile solutions that advance the frontiers of design. The company prides itself on having introduced the first large-format porcelain tiles in the U.S., along with becoming the first (and only) net consumer of tile-waste materials – meaning that it recycles more product than it produces.